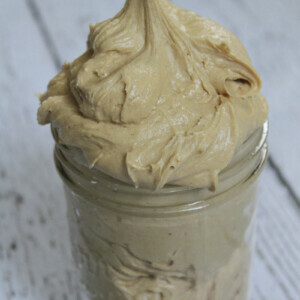 This Creamy Peanut Butter Frosting recipe is the best frosting recipe for cakes and cupcakes. It’s such a creamy frosting recipe full of peanut butter flavor. There are so many good frosting recipes, and the vanilla and chocolate flavors usually get the spotlight for being the best. This Creamy Peanut Butter Frosting should be included in the “best” category too. It really is a unique flavor for frosting, and it’s totally delicious. 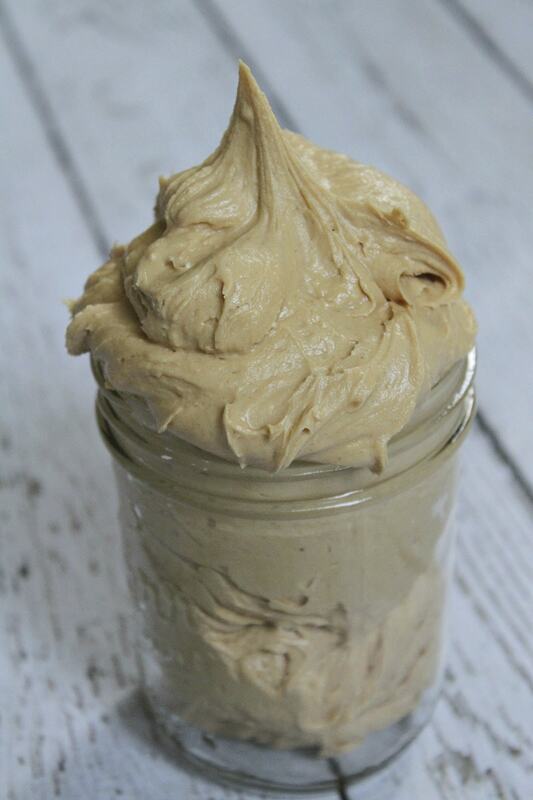 It is not necessary to refrigerate this peanut butter frosting. The small amount of milk in the recipe (1/4 cup) is stabilized by the large amount of sugar and considered safe at room temperature for two to three days. Always refrigerate any cake with a frosting that contains eggs or egg whites. 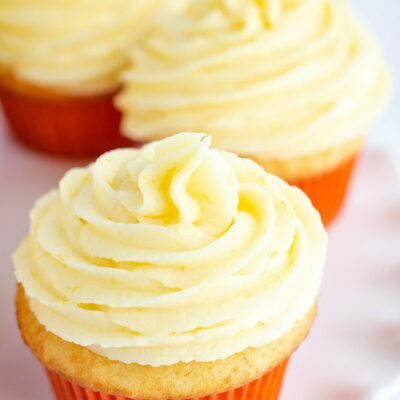 Also be sure to refrigerate any kind of frosting that is whipped-cream based or cream cheese frosting. 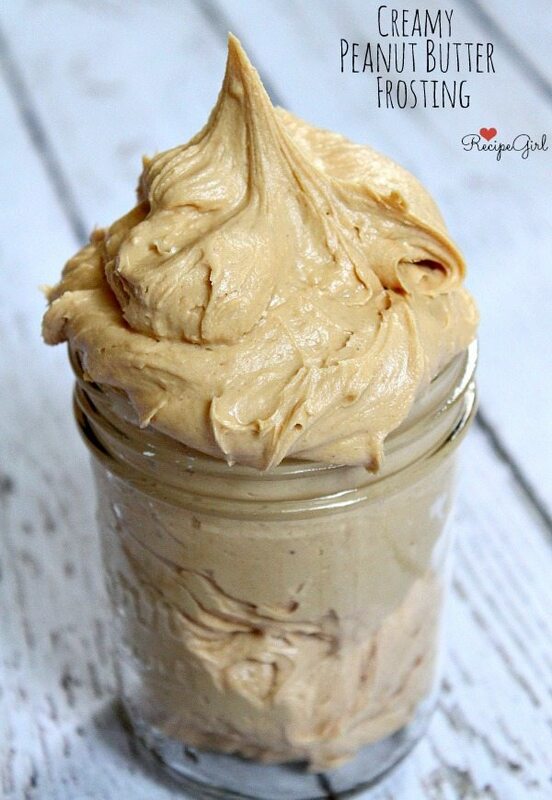 Can you freeze homemade peanut butter frosting? This recipe will make enough to frost a 2-layer cake or 24 cupcakes. 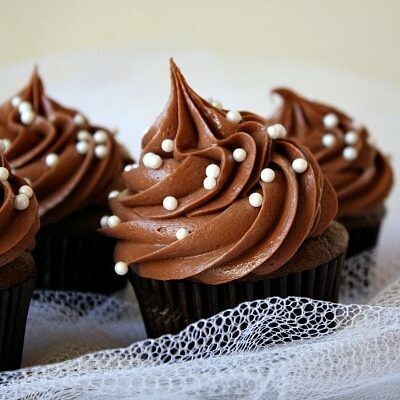 If you happen to have any frosting left over, you can freeze it in a tightly covered container for up to one month. Just let the frosting defrost in the refrigerator overnight to re-use. Make sure your cake layers are completely cool before trying to frost them. 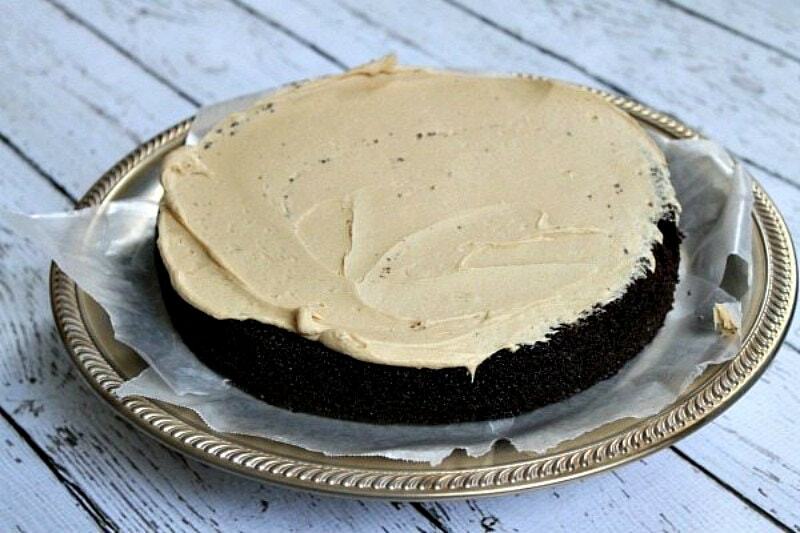 Place your first cake layer on your serving platter and slide pieces of parchment or wax paper underneath the edges. Spread the first layer of frosting on top of the first layer of the cake. Place the second layer of cake on top. Place a big dollop of frosting on top of the cake and spread to the sides. Spread the frosting down the sides of the cake and make sure it’s covered all around. Pull out the pieces of wax paper and discard. The cake shown here was turned into a Chocolate Peanut Butter Cup Cheesecake Cake. Two layers of chocolate cake with peanut butter cup cheesecake in the middle. The whole cake is covered in peanut butter frosting. 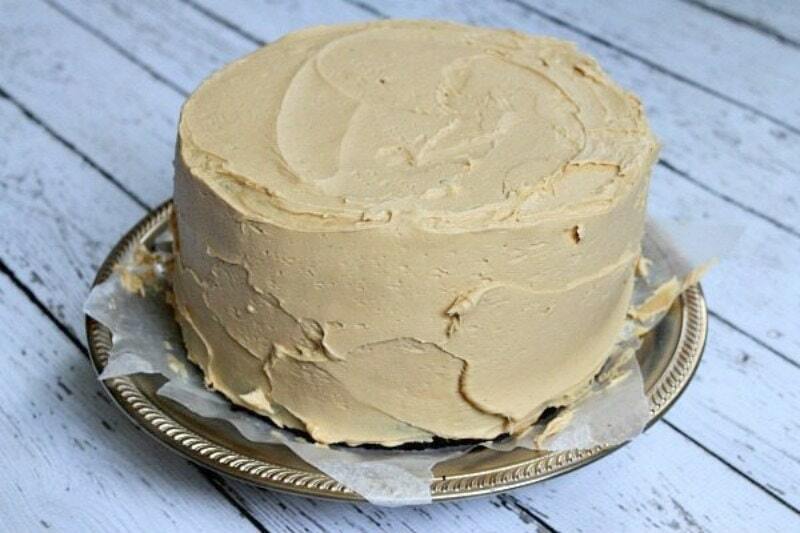 And this creamy peanut butter frosting is the perfect frosting for this cake! 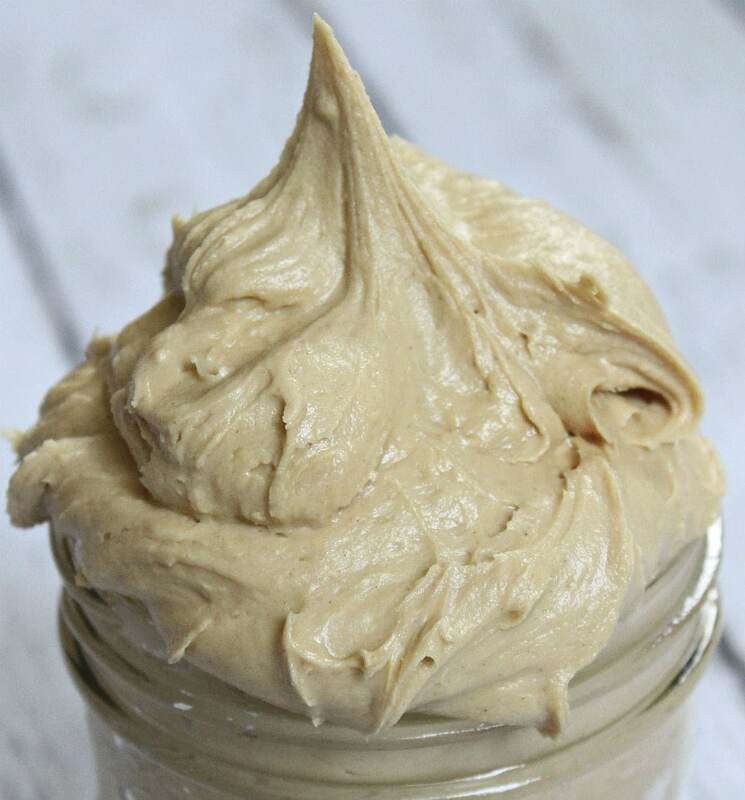 Save your vanilla and chocolate frosting recipes, and try using this peanut butter frosting on your next cake or batch of cupcakes. You’ll be so glad you did! 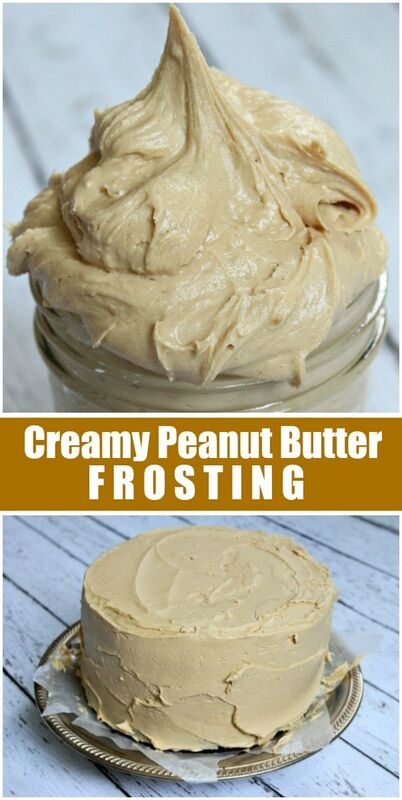 Perfect peanut butter frosting recipe! In a large bowl, use an electric mixer to combine the butter and peanut butter. Beat until smooth and well-combined. Mix in 1/4 cup milk, then add in the sugar a little at a time until it is all mixed in. 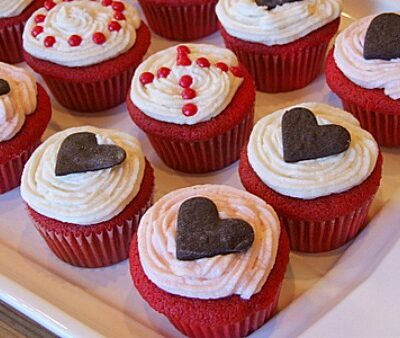 Sprinkle in a little more milk, if needed, and continue to beat until the frosting is a good spreading consistency. It should be creamy and delicious! 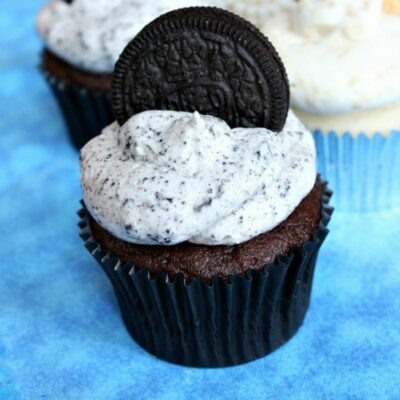 You can use this recipe to frost either a two-layer cake or 24 cupcakes. If you are preparing this recipe as GLUTEN-FREE, just be sure to use a brand of peanut butter that is known to be GF. I made this and its good but it came out to thin…what did i do wrong? Over beaten, perhaps? Too much milk? I’m wondering if I can use this on cookies, and how long the frosting will keep. Maybe omit the milk for frosting cookies? Hmmm, I’m not sure. I’ve never frosted cookies with them. Can you keep the cookies refrigerated in a covered container? How would I make this to come out as a glaze for bundt cakes? I have not tried to turn it into a glaze, so I’m not sure! I wonder if you could heat it slightly to make it pourable? Has anyone used margarine instead of butter, and if you did, how did it turn out? 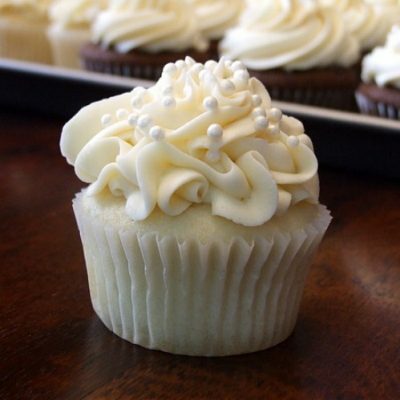 As a general rule, I would never use margarine for any time of frosting. The flavor and texture is just not the same. Thank you so much for providing this recipe! I have never made homemade frosting before and I didn’t have any store bought on hand. 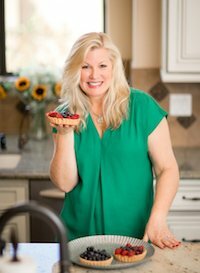 After scoping many recipes, i found this one. 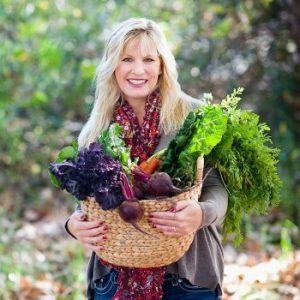 It was so easy and used items I keep stocked in my pantry. I was nervous right before tasting but this is the best frosting I have ever had!! It is very sweet and the peanut butter taste is amazing. I actually placed the frosting in the fridge for awhile which made the consistency even better. I initially made this for a batch of cupcakes (which were delicious with the frosting) but I had quite a bit left over. We have literally been eating it by the spoonfuls, on toast and crackers, and whatever else we can come up with. 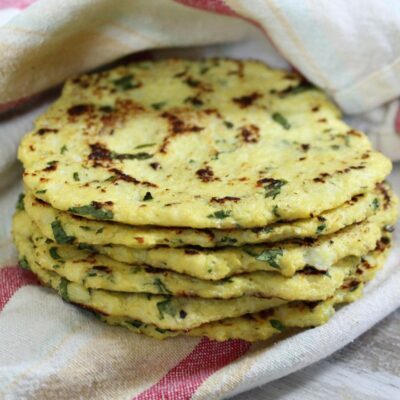 This will always be my go to recipe from now on! One question I do have is, do you know how long a sealed container of this frosting could be stored in the fridge for? I’m sure it can be stored for a few days, but it’s likely to get a bit crusty the longer you keep it. Glad you like it so much! Love this! Had to use vegan margarine and almond milk because of allergies, but this turned out amazing! Our company wanted to eat it by the bowlful. It is now the only frosting I use for my chocolate cake! I’m making this the night before wanting to frost this. How does it store? Should I refrigerate it? Theens probably should have added a little more milk. When adding don’t go overboard. Using a measuring teaspoon is the best idea. Can be a little time consuming this way but its best in the long run not to get it to runny. I’m going to attempt this tomorrow for my husband’s birthday cake. I have 1 cup of butter on hand. Do you think it’d be safe to substitute the other half cup with margarine? Or should I not risk it? Sorry I did not reply to this in time… did you try margarine? I don’t use margarine ever, so I can’t attest to whether or not it will work with margarine. Yes, 3 cups powdered sugar is right… that’s pretty much in line with most frosting recipes you’ll find. Can’t wait to try this on a chocolate espresso cake!